Although Parliamentary convention compelled the chief whip to move a cut of Rs.10 at the commencement of this debate, We should, in fact move a cut of at least several billion rupees for the Ministry of Defence and Urban Development as the treasury allocations for this ‘super’ Ministry continues to increase annually by leaps and bounds despite the end of the war four years ago. The Ministry has now acquired a reputation for being the most corrupt, wasteful and the most deadly ministry of this regime. In fact, it is the source of many of the ‘evils’ afflicting our country today: it is a well known secret that the destabilisation and the undermining of many of our democratic values and institutions – white van abductions and extra judicial killings and other serious human rights violations, the physical as well as the technical suppression of the media, the culture of impunity for crime and criminals and the total collapse of the rule of law can be attributed to this Ministry under discussion now. Due to the constraints of time, I am unable to deal with many of these issues, but I want to take this opportunity to inform this house about the insidious attempt by this Ministry to change the demography of the city of Colombo while at the same acquiring prime property in the heart of Colombo by various ‘shell’ companies held by family members of this regime. As the Krishh scandal, where millions of dollars as bribes involving some members of the family has been discussed in this house before, I will not take any time to talk about it but the plight of the people in the Slave Island Area who have been forcibly evicted by the Army on behalf of the UDA with false promises is a glaring example of attempts to change the ethnic demography of Colombo. In the guise of urban redevelopment, many families of mainly Muslim and Tamil origin in the Colombo Municipal area have been evicted from homes – many of them third generation deed holders – by coercion, threats and false promises using the full might of the military who are virtually running the UDA now. In fact, in 2007, the houses of over 300 residents in Glenis St. in Slave Island were demolished by the army. These houses were not shanties and some were actually 2 or 3 story houses and many had a history going back to over 100 years. The residents were intimidated by the army to go to Weligoda in Mattakuliya to live in temporary shelters for 6 years. Then in 2010, 18 houses in Mews St. – again predominantly Muslim and Tamil- were demolished using brute force and thuggery and many people had to run for their lives, even leaving their furniture and belongings behind. Subsequently M.M.F. Rizmiya filed a fundamental rights case FR 349/2010 in Supreme Court against the UDA on behalf of the residents with Mr. J.C. Weliamuna appearing on behalf of the petitioners. On 11th May 2011, the Deputy Solicitor General Informs SC that a decision has been taken to construct a new block of the Baseline Rd., Dematagoda housing scheme for the petitioners and the UDA agreed to give homes there for the petitioners. However. Once the Mihindupura Housing Scheme was opened, the petitioners were told, in total contempt of the earlier court order that they will not be getting houses in this scheme as earlier promised. Who is this ‘higher-up’ who dares to change a court order? In keeping with the regimes sinister plan to settle minority families in the Greater Colombo area – these families have now been told that they will be given houses in Bandaranaikepura, Rajagiriya, outside the Municipal limits. However, the ‘catch’ in this tragic story is that these innocent families have been deprived of a house because ‘higher ups’ had then decided to give the apartments promised to them to 237 families living in Railway Quarters in Dematagoda. These people did not ask for any alternative accommodation and were quite happy to continue living in the Railway quarters but the now ubiquitous ‘Carlton’ group of companies has earmarked the 2 .5 acre railway land for a special project . From its humble beginnings as a little thatched nursery in Tangalle, Carlton network is extending its tentacles all over the country. Innocent families have been forcibly uprooted from thief ancestral lands because of the limitless greed of one clan to divide prime property in the heart of Colombo amongst themselves. What is happening in the guise of urban development is a clear violation of United Nations Principles and the Universal Declaration of Human Rights. 8. Human settlement planning must seek to improve the quality of the life of people with full respect for indigenous, cultural and social needs. Settlement planning and implementation for the purpose of prolonging and consolidating occupation and subjugation in territories and lands acquired through coercion and intimidation must not be undertaken and must be condemned as a violation of United Nations principles and the Universal Declaration of Human Rights. Accordingly, existing settlements can be improved without acquiring land through coercion and intimidation, as is happening in Sri Lanka today. In fact, these are the principles I followed as Minister for Urban Development under President Kumaratunge and the Sahaspura flats were built for the shanty dwellers of Wanathamulla without dislocating them from the existing fabric while preserving the ethnic and cultural values of the area. While the Rajapaksa regime continues to violate many of the international agreements we have already ratified over the years, the President in assuming his new role as the Chair of the Commonwealth for the next two years, has agreed, according to the communique issued at the conclusion of CHOGM on 17th November to accelerate efforts towards the ratification of all major human rights instruments. As you may be aware, in the area of international humanitarian law, the Rome Statute of the International Criminal Court has not been ratified in Sri Lanka because PM Ranil Wickramesinghe in 2002, refused to allow Sri Lanka to be a signatory to this statute on the basis that Sri Lanka had an independent and credible judicial system to deal with war crimes and other serious human rights violations, if it were to occur in our country. In addition to fast tracking these conventions, the CHOGM communique agreed by all its members, in item 39, reiterates its commitment to strengthen further the international human rights system in keeping with the Vienna +20 process of the Vienna declaration and programme of action. One of the key recommendations of the Vienna +20 declaration, adopted in Vienna on June 26th this year is the establishment of a World Court of Human Rights. That is why for many of us who have seen through the duplicitous nature of this regime and understood it’s ‘running with hares and hunting with the hounds’ policy, it did not come as a great surprise to learn that family members of this regime have been making large contributions to the ruling Conservative party since 2011 despite the pre Christmas pantomime put on by PM Cameron and President Rajapaka on behalf of their respective constituencies during the CHOGM summit two weeks ago. In a letter written to PM Cameron by British MP Tom Blenkinsop after the summit in Colombo, he expresses concern of news reports that a prominent donor to the Conservative party has links to the Rajapaksa regime and requests Sir Jeremy Heywood, Cabinet Secretary to look into the matter urgently. ‘Lycamobile, a large telecommunications company has donated £426,292 (nearly Rs 101m) to the Conservative Party since 2011 and it was reported in the Guardian in June 2012 that they had not paid corporation tax for thee years. A company owned by the Lyca group has shares in a firm with President Rajapaksa’s nephew Lyca’s travel agency Lycafly became the preferred partner of Sri Lankan airlines which is chaired by President Rajapaksa’s brother in law. Most recently Lycamobile was branded ‘Gold Sponsors’ of the Commonwealth Business Forum ahead of CHOGM. Mr. Speaker, the outcome of the investigation by Sir Jeremy Heywood wil be of great interest not only to the British Parliament but to us in this house as well. ‘British transplant patients are being offered illegally trafficked kidneys by an international organ dealer who promises to arrange surgery at a hospital chaired by the brother of the Sri Lankan President. The government controlled hospital is being recommended to patients as a suitable place to receive an organ purchased for tens of thousands of pounds in the black market. A times journalist posing as a relative of a Briton was offered the chance to buy an organ from a donor from India or the UK, with the twin operations to remove and implant the kidneys carried out simultaneously in Colombo. Mr. Speaker, as this is a lengthy article I will table it for your perusal. As buying and selling human organs are by banned by international law, this is an extremely serious allegation. This not only tarnishes the name of the Rajapaksa family and the regime but it also tarnishes the image of the country as a whole. That is why we want a response from the defence secretary regarding these allegations. If it is not true, he should make arrangements to sue the newspaper in the UK courts, in order to clear his name as well as that of our country. 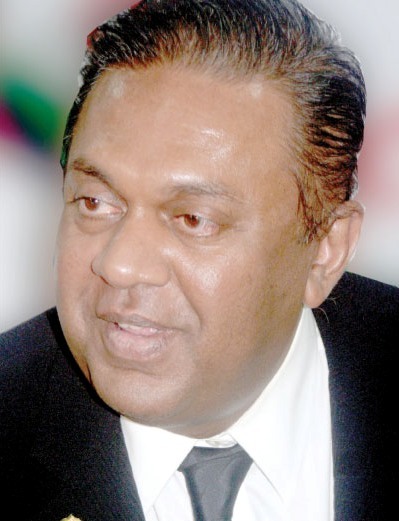 *Speech made by Mangala Samaraweera M.P. opening the Committee Stage debate in Parliament on the Ministry of Defence and Urban Development on 3rd Dec. 2013. 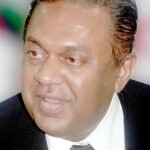 MR.SAMARAWEERA- THANK YOU VERY MUCH YOUR PRESENTATION WITH A BACKBONE. MY DEAR RURAL BRAIN-WASHED SINHALA BUDDHIST/CHRISTIAN COMMUNITY – PLEASE WATCH GOTA’S REACTION.